Cleaning your recreational gear is an easy and effective way to prevent the spread of invasive species. For example, removing your wading boots and spraying all exposed surfaces with a 10% bleach solution can kill hitchhiking species including Didymo, chytrid fungus, and ranavirus. ANNAPOLIS, MD (July 11, 2012) – Summer is here and it is time to dust off that kayak, pull the waders out of that closet, put a new coat of wax on that boat, inflate the tires on that trailer, and string up some new line on that fishing reel! New adventures await you on Chesapeake Bay and in Maryland’s beautiful streams, rivers, and lakes. As you set out on your summer excursions, keep in mind that your actions, or inaction, can cause irreversible damage to the very ecosystems you enjoy. The things that you use, be it your waders, wading boots, kayak, canoe, boat motor, boat trailer, and even your mask and snorkel may harbor invasive species and contribute to their spread. Zebra mussel, quagga mussel, Didymo, and chytrid fungus are just a few of the harmful species that have been inadvertently spread throughout many regions of the U.S. by outdoor enthusiasts, including kayakers, canoeists, anglers, boaters, and divers. Stopping the spread of these species in Maryland requires your vigilance! With the summer of 2012 here, the Maryland Invasive Species Council has chosen “Clean your Gear” as the July 2012 Invader of the Month. Recreational gear can become a vehicle on which invasive species can be carried from one water body to another. For example, the Zebra mussel (Dreissena polymorpha) is an invasive mollusk native to Eurasia that was first introduced into the Great Lakes in 1986. Since then, this species has been introduced throughout much of North America, spread primarily by recreational boaters. Zebra mussels have “hitchhiked” great distances attached to boat hauls, props, or motors, or hidden in live wells, coolers, and bait buckets. Recreational boaters trailering their boats from one water body to the next can inadvertently spread zebra mussels and other “hitchhiking” organisms. Invaded areas have suffered ecologically. Zebra mussels have drastically altered aquatic food webs and have been linked to declines in commercially important fisheries. The economic impacts of zebra mussel invasions have been huge. Biofouling by zebra mussels of municipal and industrial water pipes and infrastructure require millions annually to treat. Zebra mussels and other aquatic hitchhikers cost us all a lot of money! In Maryland, zebra mussels are known from the Lower Susquehanna and Sassafras rivers. The threat looms large that this invasive species may invade other Maryland rivers, lakes, and reservoirs with the aid of boaters unaware of the issue. Zebra mussels, invasive aquatic plants, and other large organisms attached to boat hauls, props, or trailers are usually easy to detect and remove. But, not all hitchhiking species are obvious. Many are not easy to see, even if you are looking for them. Microscopic algae, pathogens, or larvae can remain hidden in your recreational gear and can also be transferred from one water body to the next if you are not careful and thoroughly clean your gear between water bodies and outings. Didymo (Didymosphenia geminata), commonly called “rock snot” or “boulder boogers”, is a species of freshwater diatom native to cold regions of North America, northern Europe and Asia. In recent years, Didymo has expanded outside of its native range and has become a nuisance species in many prized trout streams. Didymo attaches to submerged surfaces in streams and can form thick mats, smothering important habitats for stream insects and other bottom-dwellers. 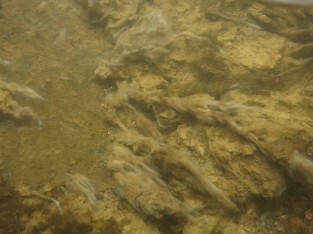 These “blooms” can reduce the food sources of game fishes. It is believed that anglers have unwittingly spread Didmyo, carrying it from one water body to another in or on their boots and fishing gear. 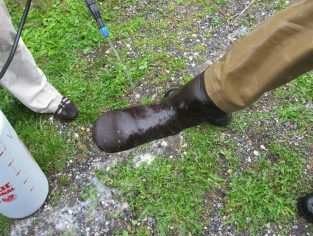 Even a single cell of Didymo attached to a pair of chest waders or hidden under a boot lace can contaminate a new water body. Didymo was first discovered in Maryland in 2008 in the Gunpowder River. It is now known to also occur in the Savage River and portions of Big Hunting Creek. In recognition of the threat posed by Didymo and the role that waders and wading boots have had in the spread of this invasive species, the Maryland Department of Natural Resources banned the use of felt-soled wading boots in March 2011. Didymo is not the only tiny invasive species that is a big threat to Maryland’s aquatic ecosystems. Chytrid fungus and ranavirus are infectious agents that have decimated populations of amphibians and reptiles in many parts of the world, including Maryland. These tiny pathogens can also be spread on contaminated recreational gear. Protection of our waters from invasive species requires an informed and vigilant community of anglers, boaters, canoeists, kayakers, divers, and other outdoor enthusiasts here in Maryland. Your actions can make all the difference. And most importantly, spread this message to other Marylanders! Give them this information and tell them to pass it on! Invader of the Month diseases and other organisms, other invertebrates. permalink.